In a final, majestic hail to the chief, the nation bade a lingering goodbye to Ronald Reagan on Friday at a stately service in Washington under somber skies and at a hilltop burial ceremony in his beloved California beneath a setting sun. "He is home now. He is free," said his son, Ron Reagan. "In his final letter to the American people, Dad wrote, `I now begin the journey that will lead me into the sunset of my life.' This evening, he has arrived." After the service, a tearful Nancy Reagan kissed and stroked her husband's coffin while clutching an American flag — seemingly reluctant to leave his side. "I love you," she said quietly. The former first lady was surrounded by her crying children, who tried to console her just before the sun disappeared from the gold-tinged hills in the distance. The flag-draped casket, accompanied by a stoic Mrs. Reagan, arrived at the library after a flight from Washington and a slow, 25-mile motorcade from the airport. Hundreds of well-wishers cheered the former first lady when she left the plane, and crowds along the motorcade route waved flags, held their hands over their hearts and applauded as the hearse passed. The burial and the funeral at Washington National Cathedral dropped the curtain on a week of American majesty. Dozens of world leaders, the four living ex-presidents and lifelong friends attended the state funeral. "Ronald Reagan belongs to the ages now," President Bush said in his eulogy, "but we preferred it when he belonged to us." The cathedral's great bells pealed as Reagan's casket arrived in the rain, the flag over it a burst of color in the gray pall, and pealed again with the motorcade's departure. Irish tenor Ronan Tynan filled the soaring space of the cathedral with "Ave Maria." The "Battle Hymn of the Republic" rang out. And after a week of largely silent ritual, there were words — a stream of them praising the 40th president for rendering "bold strokes" on the American canvas, for staying humble, for loving his wife, for having a quip for any occasion. "His politics had a freshness and optimism that won converts from every class and every nation — and ultimately from the very heart of the evil empire," said former British Prime Minister Margaret Thatcher in taped remarks presented at the funeral. Thatcher, who has given up public speaking after a series of small strokes, sat next to Mikhail Gorbachev, who led that Soviet "empire" and eventually became Reagan's friend. Mrs. Reagan, 82, slow in step yet keenly alert to every polished move in the week's remembrance, shepherded the casket with quiet intensity, turning the most public of events into a series of private moments. She kissed it lightly at the Capitol Rotunda, where Reagan lay in state. She ran her hands slowly up and down the stripes of the flag and, leaning close, seemed to whisper something to her husband of 52 years. Her expression rarely changed, but Bush and his father brought smiles to the funeral service by recalling her husband's wisecracks. The elder George Bush, in his eulogy for the man he served as vice president, remembered when Reagan was asked how a meeting went with South African Bishop Desmond Tutu. "So-so," Reagan said. Mrs. Reagan laughed. Her daughter Patti Davis laughed harder and longer. They exchanged glances with each cherished recollection. Reagan's other surviving children, Ron and Michael, also were by her side. Reagan's daughter Maureen, from his first marriage, died from cancer in 2001. Patti Davis recounted Reagan's last moments in her eulogy at the burial service. "I know that at his last moment, when he opened his eyes, eyes that had not opened for many, many days, and looked at my mother, he showed us that neither disease nor death can conquer love," she said. After the California service, the casket was carried to the burial site, where final prayers were offered, an artillery battery and riflemen fired salutes, and a bugler played "Taps." Four Navy fighter jets soared overhead, one peeling up and away. American guns around the world fired in Reagan's honor — 21-gun salutes at the stroke of noon local time at U.S. military bases, at dusk, another worldwide round of 50-gun salutes. Final military flourishes saw Reagan's body off at Andrews Air Force Base in suburban Maryland, the many playings of "Hail to the Chief" over the past few days giving way to Antonin Dvorak's "Going Home." That capped three days of pageantry and tradition unique to a presidential state funeral — the casket's procession by horse-drawn caisson along Constitution Avenue, the lying in state in the Capitol's hall of heroes and the national funeral service before an invitation-only crowd of 4,000. Tens of thousands of ordinary Americans visited his casket on Capitol Hill. The service drew a large contingent of foreign guests, including 25 heads of state or government, 11 former leaders and more than 180 ambassadors and foreign ministers. Several dignitaries and celebrities attended the burial ceremony in California, including actor Tom Selleck, former hockey star Wayne Gretzky, and Arnold Schwarzenegger, who also became governor after a career in acting. Reagan died last Saturday at 93 from pneumonia complicated by the Alzheimer's disease that had progressively clouded his mind. He told the world in 1994, five years after ending his two-term presidency, that he had Alzheimer's in his famous letter to the American people. 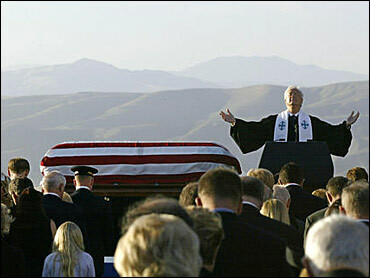 Reagan had begun thinking of his last rites in 1981, his first year as president, and planned some elements of the funeral — inviting the elder Bush and Thatcher to speak, asking Supreme Court Justice Sandra Day O'Connor to do a reading and expressing a wish for an operatic soloist, family representatives said. Mrs. Reagan filled in the program by asking the current president to take part, and inviting former Sen. John Danforth, an Episcopalian priest, to officiate at the multi-faith service. Delivering the homily, Danforth read from the Sermon on the Mount, Reagan's favorite Biblical theme. "If ever we have known a child of light, it was Ronald Reagan," Danforth said.